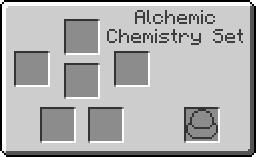 The Potion Flask is used to create Blood Magic potions in the Alchemic Chemistry Set. They can be found in dungeons or crafted. Each Flask starts with eight uses. Different types of potions are crafted by combining Potion Flasks and Weak Binding Agents/Standard Binding Agents and different ingredients in the Alchemic Chemistry Set. Arrow Reciprocation Reflect damage to the entities that damage you regardless all armor protection (for player and entities). Ender Pearl Planar Binding Stops most forms of teleportation. Soul Sand Soul Fray Reduce network LP intake by 90%. Runic Plate Soul Harden Reduces damage taken while bound armor is equipped. Increases bound armor protection from 90% of damage to 100% for its duration. Blank Slate Splash Turns into a splash potion instead of acting on the player (useful for slowness potion and weakness potion). To add effect you need to take one reagent from the previous list, a potion flask and binding agent: weak or standard. Several effects can be added to a potion, but the more effects a potion has the less chance of success. And in case of failure, the potion will explode. Weak Binding Agent differs from the Standard one in that it has less chance of success in creating potions with a multitude of effects. Chances of success are calculated by the formulas: 0,4^X (Weak Binding Agent) and 0,65^X (Standard Binding Agent). Where X is the number of effects in the potion before adding a new one. This is an example recipe. You can use another reagent instead Blaze Powder. See the available reagents in the previous list. The chance to successfully addition new effect depends on the number of effects that the potion already has. Blaze Powder adds effect Strength I (2:00). Blank Slate adds Splash effect. The current effects of the potion can be power up by сatalyst. Power catalysts: Mundane, Average, Greater give 2, 3 and 4 levels of effects, but decreases its duration. Lengthening catalysts: Mundane, Average, Greater increases the potion's duration. Increases the duration of Strength effect. Refill and remove all effects. Potion Flask has no known uses in crafting. This page was last modified on 16 December 2018, at 13:55.